Kapalua Starlight had to settle for 2nd in the Donna Freyer S at Laurel.The filly raced on or near the lead and could just not hold on in deep stretch. She is trained by Thomas Albertrani for owner/breeder Robert Masiello. The stakes is restricted to horses trained in SC and KAPALUA STARLIGHT was prepared for the track at Kirkwood Stables. The colt race, the Christopher Elser S. was won by WHIRLIN CURLIN who got his start at the Webb Carroll TC. Wise Gal and jockey Steve Hamilton won the Selima Stakes impressively. Photo by Laurie Asseo. Saturday’s card at Laurel Park will feature something new, at least to Maryland eyes. The nine-race log includes a pair of stakes restricted to horses that spent at least 90 days in South Carolina by the end of June of this year. The $50,000 Donna Freyer, for two-year-old fillies, will go as race five. The Christopher Elser Memorial, also a six-furlong test, this one for straight two-year-olds, is carded as race seven. Both carry purses of $50,000. The twin races had spent the last several years at Parx Racing, which is where they began. This year will mark their first visit to Laurel Park. Early returns on the move, Elser said, are promising. “We have double the entries they had previously,” he pointed out. The Elser ran with just five horses last year after three scratched. Eleven are entered for Saturday’s tilt. And the Donna Freyer had to be postponed last year as a result of poor entries; nine are entered Saturday. And that’s despite a purse reduction, from $75,000 down to $50,000. 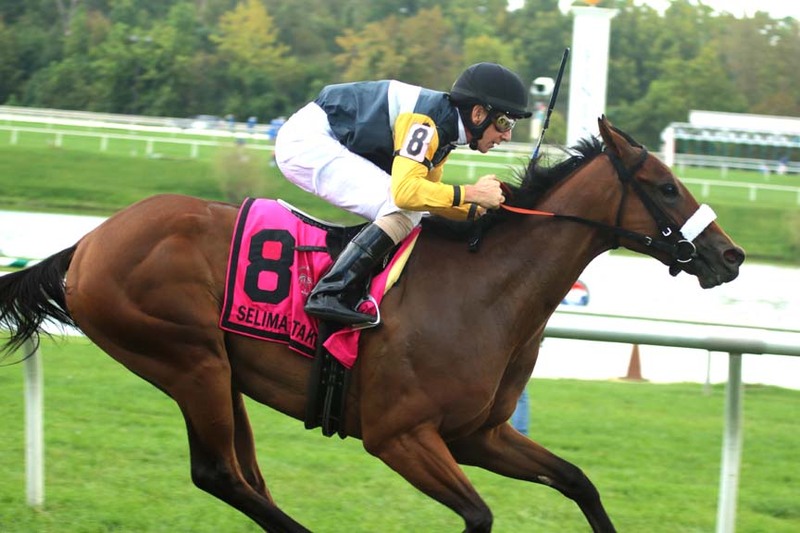 Elser said that the Maryland Thoroughbred Horsemen’s Association agreed to put up the same amount it pays out for a Maryland-bred allowance race — $35,000 — and the remainder of the purse comes from SCTOBA. Handle generated all stays in Maryland. “We appreciate the welcome of the Maryland Jockey Club and the horsemen,” he said. The races serve to promote South Carolina’s thoroughbred industry, which, though it has no racetrack, includes a vibrant network of training centers. The most promising of the Freyer runners — at least at this point — is Wise Gal (5-2 morning line). The Dove Houghton trainee was impressive in her first two starts, both grass sprints, winning at first asking and following up with a dominant win in the $100,000 Selima Stakes, also at Laurel. She faltered going a mile in the Chelsey Flower at Aqueduct three weeks ago; Saturday will mark her first try on the dirt. Five of the nine runners in the Donna Freyer are based at either Laurel or Pimlico. There are no stakes winners entered in the Christopher Elser. The morning line favorite is Hidden Funds (7-5), the Mike Pino trainee who has one win and two third-place finishes from four starts. And perhaps a couple more in Saturday’s stakes. Awesome Again gelding out of champion Soaring Softly broke through at Del Mar. Manitoulin has always marched to the beat of his own drummer. The striking chestnut was born via elective Cesarean section, with a dedicated team at Hagyard Equine Medical Institute near Lexington ensuring his survival in the fragile moments that followed his delivery. Awesome Again stands at Adena Springs Kentucky. Descended from a long line of brilliant Darby Dan bloodlines, the product of a mating between Awesome Again and champion 1999 grass mare Soaring Softly, he spent his early days on the farm near Lexington with a nursemare, while his dam healed from the surgery that brought him into this world. A fighting spirit enabled the fiesty runner to thrive, but it took patience, gelding, 17 starts, a trip to California, and the faith of his Phillips Racing Partnership connections to unearth the talent they knew ran in his veins. 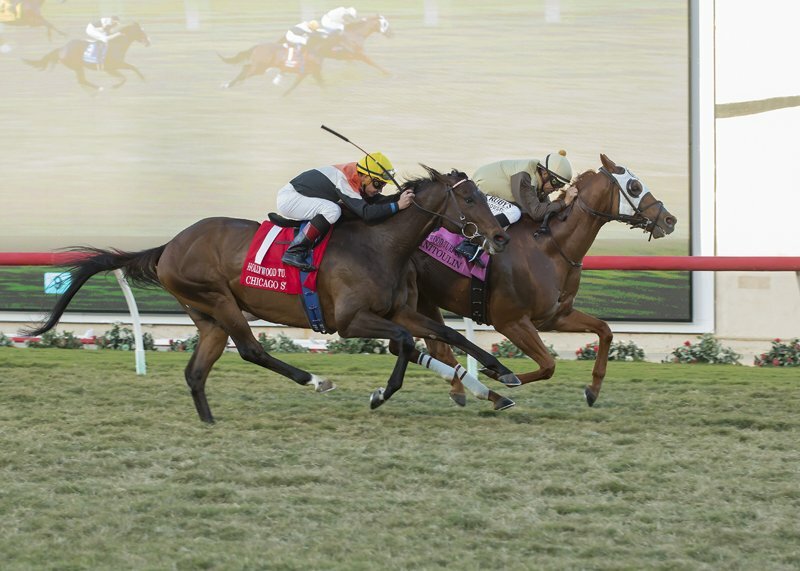 Finally, in a 1 1/2-mile test Nov. 24 on the Del Mar lawn, that talent shone through when Manitoulin withstood the late challenge of fast-closing 7-5 favorite Chicago Style to win the $200,000 Hollywood Turf Cup Stakes (G2T). Trainer Jimmy Toner, who conditioned Soaring Softly through her championship career and who landed his first Del Mar stakes score Friday, said he never doubted Manitoulin’s ability. Channeling his energy and that fighting spirit was the challenge. In previous stakes attempts, Manitoulin was eighth in the 2016 Exacta Systems Dueling Grounds Derby, fourth in the Arlington Handicap (G3T) this July, and seventh in the Oct. 19 Sycamore Stakes (G3T) at Keeneland, which Toner called a “throw-out race” because of an outside post and other unfavorable factors. “Other than that (Sycamore finish), he’s run some very good races this year, and I think he could compete at the top level next year,” Toner said. In allowance company this season, the 4-year-old gelding has three wins and a second. Maybe a familiar connection was felt between Manitoulin and Hall of Famer Mike Smith, who was aboard for the first time in the Hollywood Turf Cup. “I’ve got some history here. I rode his mother, and I rode the sire, too,” Smith said. Toner told the jockey to warm Manitoulin up briskly, and to keep him forwardly placed from the start. “If you let him relax next thing you know, he’s relaxed and just galloping around there, so you have to put his mind into the game. Beautifully rated in an outside stalking position just off pacesetter Tequila Joe, Manitoulin never disengaged from that rival through easy early fractions of :25.30, :51.36, and 1:17.08. After a 1:43 mile, the eventual winner went to the lead in the upper stretch and showed his gameness when set down for the drive, even though Smith lost his whip near the sixteenth pole. Chicago Style came flying from sixth in the field of seven, but could not get up in time. Manitoulin held the victory by a neck in a final time of 2:30.16 on firm turf, while Flamboyant finished third by 1 3/4 lengths. Tequila Joe, Lottie, Prince of Arabia, and Inordinate completed the order of finish. Infobedad and Prime Attraction were scratched. Sent to the gate at 4-1, Manitoulin returned $10.40, $4.80 and $3.40 while collecting his fifth victory in 17 starts. First money of $120,000 increased his earnings to $394,506. Chicago Style paid $3.40 and $2.40, while Flamboyant returned $2.60 to show. A trip back to Lexington is in order for the gelding after his California raiding trip. “We’re going to drop him off at Darby Dan,” Toner said. “He’ll get a freshening down there; he had a tough campaign this year and topped it off today. We’ll send him home now and they’ll freshen him up, and we’ll pick him up mid-winter and hopefully have him ready for Keeneland and a top-level campaign next year. ONEBALLNOSTRIKES (Include) broke his maiden at Monmouth as a 2yo in his first start. Running back in allowance company he garnered a second and a win during the remainder of his two-year-old campaign. As a three-year-old, ONEBALLNOSTRIKES had a win at Aqueduct and now another win in allowance company at PARX for owner Carguys Racing LLC. Going a mile and seventy he scored by 2 1.2 lengths, He is trained by John C. Servis. He has earned over $137,000. ONEBALLNOSTRIKES was started and then consigned and sold by Kirkwood at Timonium this past spring. 3 year old filly BERNED, (Bernardini) won the SAFELY KEPT S.at Laurel to earn her first black type. She is owed byThree C Stables, West Point Thoroughbreds & Robert Masiello and was bred by AR Enterprises, LLC (KY). Trained by Graham Motion, she has earned $224,781. She showed no early speed and was last through the opening quarter, but began to pick up her speed entering the far turn. She was then forced five wide but kept up the long, sustained drive going all the way to pull off the upset.